We all know that car maintenance record helps the owner track the services done and the value of motor vehicle is preserved with regular maintenance. These maintenance records will enable you to understand your car’s performance and will help you in making an accurate assessment of the car's condition. 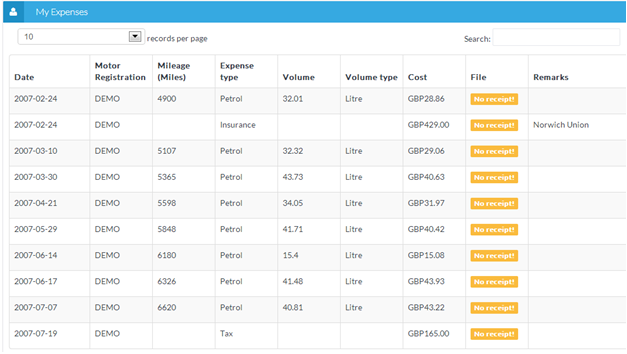 Motor record helps you to manage your vehicles in a cost effective manner by helping to track each and every expense and vehicle utilization. We manage online maintenance records for your vehicles which will allow you to track your maintenance and service expenses on a regular basis. You save a lot of time by giving us the responsibility in maintaining your motor records online where our system consolidates your costs automatically. We provide your automobile maintenance records online which can be the entire history of your automobile. You can set reminders in advance and you will never miss important dates like annular service, engine oil change, tax, insurance, parts change, etc. This service is available for all motor vehicles and automobiles including cars and trucks. Each vehicle has its own maintenance needs, so you can keep track of maintenance schedules for each vehicle. The Maintenance Scheduler calculates service needs based on your vehicle’s mileage and your settings. It checks engine-operating conditions and helps coordinate oil service dates and other maintenance check-ups. You can check the maintenance records online whenever and wherever you need by using your mobile phone or a computer. For example, you can bring up the details of last service done when you are with a different mechanic who may not know the details. This saves you a lot of time and helps you relax and stop worrying about spending money on unnecessary maintenance expenses. We keep your data safe and secure. The data is converted into a useful form through our solution. You will be prompted with regular alerts and messages with respect to your vehicle maintenance and services. Copyright © 2013-2014 MotorRecord. All Rights Reserved.